What is Dry Needling for Shoulder Pain? In Travell’s method, trigger points are punctured by either a low gauge solid filliform needle (another words an acupuncture needle) or by a hypodermic needle. In fact, Dr. Travell practiced both dry needling, and the injection of lidocaine into trigger points. But over time she found, and research in the U.K. supports this, that it is the action of the needle itself that has the efficacy, not the lidocaine. In a study in the UK, it was found that dry needling, injection of lidocaine, and injection of saline placebo were all equally effective, and so it was theorized that the physical, mechanical affect of the dry needle, acting like an acupuncture needle, is what eliminates the trigger points at the source of the pain. In fact, Osler included a section on the use of acupuncture for the treatment of “lumbago and sciatica” in his respected textbook The Principles and Practice of Medicine which was the standard medical school text from 1892 all the way until 1949. Acupuncture and dry needling techniques can be identical, depending on the style of practice of the practitioner. Chinese style tendino-muscular acupuncture relies on careful palpation of what are called “Ah Shi” points, which often correspond to both trigger points and/or motor points in the myofascial tissue. Chinese acupuncture tends to use the thick, lower gauge needles necessary for puncturing contraction knots with a high degree of precision. On the other hand, lighter styles of acupuncture, such as Japanese style, or some of the American styles, require very shallow insertions of thinner gauge needles, as well as a detailed knowledge, not of western anatomy, but of the channel networks and connections. These systems of acupuncture, which emphasize light needling of distal points on the body, away from the actual site of pain, are generally ineffective for myofascial trigger point pain, but can be very effective for digestive problems, insomnia, and a million other somatic issues. Is Dry Needling A Kind of Acupuncture? Thus, while some forms of acupuncture are not at all the same as dry needling, the term dry needling can refer quite specifically to what I call Myofascial Acupuncture, which is dry needling of trigger points and motor points that are the root cause of Myofascial types of pain. This kind of dry needling is extremely successful in the treatment of a wide range of sport’s injuries, overuse injuries, sprains, strains, and even sciatic pain, because when you release the contraction knots, the muscle spindles, the trigger points and motor points, muscles lengthen, and the pressure on tissues and nerve roots is lessened. 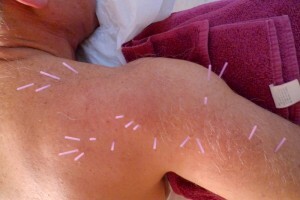 It should be pointed out that to some extent the use of the term Dry Needling, as opposed to Acupuncture, is simply a kind of “political term” used in some contexts to differentiate an western anatomy-based style of practice with thick needles, from a channel or meridian based style of practice with thin needles based on the puncture of distal, rather than proximal points. But the distinction is a bit facile, as there are many different styles of acupuncture practice, including a thick needle, anatomy based one, centering on a knowledge of trigger points and motor points. In my San Diego acupuncture practice I specialize in the use of dry needling for shoulder pain, and also neck, hip, and back pain. I use dry needling in the treatment of various kinds of shoulder pain, ranging from frozen shoulder, or adhesive capsilitis, to throwing injuries (I recently had a very successful series of treatments of a Major League Baseball pitcher with a sore shoulder), rotator cuff injuries, and generalized tightness. Some of my most common shoulder pain dry needling acupuncture patients are para legals and hair dressers, who, for different reasons overuse their shoulders, and at the same time suffer from a lot of stress. My treatment of shoulder pain, from Adhesive Capsulitis/Frozen Shoulder, Chronic Myofasical tension pain, the shoulder pain associated with tension and migraine headaches, acute sports injuries like bicipital and supraspinatus tendonitis, rotator cuff injuries, even torn labrum, involves a unique combination of the following therapies, along with anti-inflammatory and analgesic Chinese herbal medicines taken by mouth, of the type used in the martial arts for millenia. 1) Dry Needling into the Motor Points and Trigger Points to release the muscles, relieve pain, and increase the range of motion of the target muscles that act on the bones of the shoulder joint: The Upper Trapezius, Subscapularis, Pectoralis Major and Minor, Supraspinatus, Infrspinatus, Teres Major and Minor, Deltoid, Rhomboids, and Latisimus Dorsi. Dry Needling and Acupuncture are also done on the lattice work of paraspinal muscles that act on the relevant vertebrae of the Cervical and Thoracic regions. 3) Electrical Stimulation on the Acupuncture needles to further break up fascial adhesions if necessary. I especially like electrical stimulation for Frozen Shoulder. 4) Cupping and Sliding Cupping with Ayurvedic Herbal Oils like Mahanarayan Oil (Dabur is an excellent brand) and Divyadeep Tal to release adhesions in the fascia (fascial adhesions) that restrict joint range of motion and to increase blood circulation to the inflamed tissues and reduce inflammation. 5) Heat treatment with the Chinese TDP Long Range Infrared Lamp to reduce pain and eliminate inflammation. 6) Application of counter-irritant Chinese Herbal Linaments to relieve post treatment soreness by improving blood circulation and reducing inflammation.